Is your skin in need of a boost? Here is a great, brand-new product that could give you that little extra you’re after. 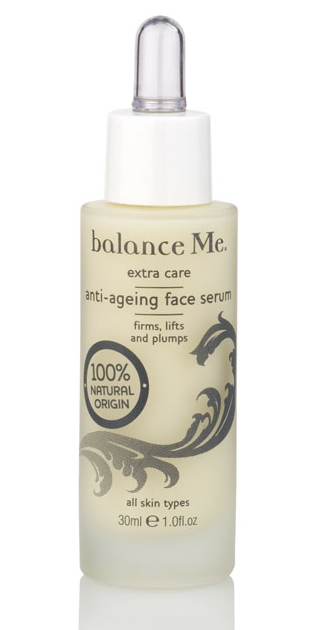 The Anti-ageing face serum from Balance Me is an active, potent product that contains angelica and neroli to target the visible signs of ageing. Its formula also includes conditioning abyssinian oil, shea butter and the the purest grade of hyaluronic acid to help bind the water within the intercellular structure of the skin. It’s 100% natural so it’s safe to use no matter your skin type. To use it, smooth a few drops (you really won’t need much at all!) on your skin after cleansing in the morning and evening, and rub into it using firm movements. After you have applied the serum, make sure you use some moisturiser to lock in the moisture and protect your skin. It’s a lovely scent – slightly lemony but also very earthy – that will brighten up your complexion and help your skin’s elasticity to be at its optimum. It should also last you a very long time as you literally just need to apply a few drops at a time. A good start to my New Year regime! A 100% natural, potent anti-ageing serum with anti-oxidant rich blackberry seed extract and ultra-hydrating pure hyaluronic acid designed to target lines and wrinkles, protect from environmental damage and restore your skins natural youthfulness. This entry was posted in Skincare, Uncategorized and tagged 100% natural origin, anti-ageing face serum, balance me, exra care organic, fine lines, Natural, Serum. Bookmark the permalink.